Kerala, on the southwestern coast of India, is home to seven extant synagogue buildings, of which four are located within the city of Kochi (formerly Cochin). Of these four, two can be found in the Mattancherry area in Jew Town on Synagogue Lane. Best known is the Paradesi Synagogue, which was the only Jewish house of prayer built by the Paradesi (“foreigners”) Jewish community, and the sole synagogue in Kerala that remains fully intact and still operational. The nearby Kadavumbagam Synagogue survives in part as a building, although it has not been a house of prayer since 1955 when its congregation of Malabari Jews immigrated en masse to Israel. The Tekkumbagam and Kadavumbagan Synagogues on the mainland of Ernakulam, also built by the Malabari Jews, both closed after their congregations likewsie immigrated to Israel in the mid-1950s. Kochi became an important city when a flood in 1341 created a natural and safe port, replacing Cranganore, north of Kochi, as the chief harbor of the Malabar Coast. The city’s name is derived from Kocchazhi, meaning new or small harbor. Today it has a population of around 600,000, spread across islands and promontories in a beautiful location between the Arabian Sea and the backwaters that traverse the area. Two of its main sections – the bustling, commercial Ernakulam and the more tranquil peninsular district of Mattancherry to the west – are linked by a popular system of pedestrian ferries, as well as a network of roads and bridges making a visit to the two synagogues in each area an easy and memorable experience. 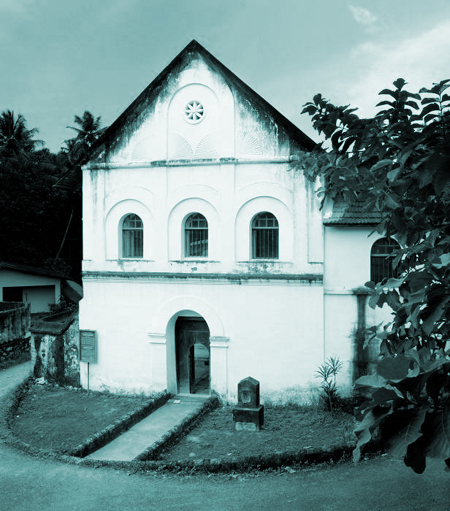 Kerala’s three other former synagogues, all built by the Malabari Jews, can be found to the north of Kochi in the town of Parur (Paravoor), in the nearby village of Chendamangalam, and farther a field in Mala. All can be visited in a one-day excursion from Kochi via hired car and driver or, with determination and more time, by public buses and connecting taxis. Should any traveler wish for a longer and more leisurely visit to these synagogues outside of Kochi, there are a few recently opened hotels of good standard in the area for an overnight stay. An investigation on the internet will easily bring up these places.